Not sure what to do this weekend? Browse the city’s restaurants, bars and upcoming events and book a spot instantly. You can scout the latest cinema releases and skip the queues by selecting and paying for your seats. Plus, Qube vendors will be regularly announcing promotions through the app, so keep an eye out for giveaways and one-off offers. Not all vendors will require you to process your payment through the app, but for those that will, you can use a credit card. Download Qube and sign up using your email or Facebook account. You will be asked to enter an invitation code. Qube makes planning Cairo a fast, hassle-free experience. 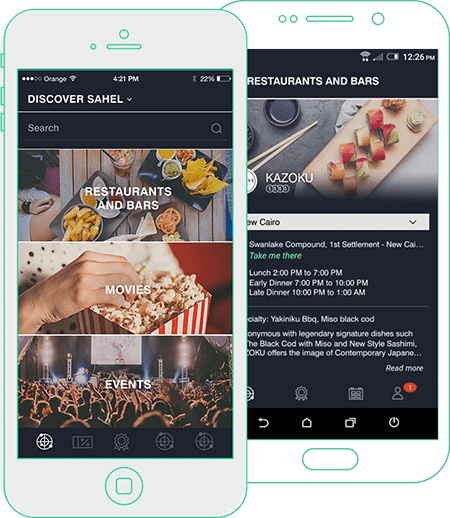 Skip the ticket queue by browsing the city’s restaurants, bars, cinemas and upcoming events and making instant reservations day and night, all on one platform. Discover a variety of venues and upcoming events and browse their availability instantly. Hit reserve. The app registers all your reservations in one place, so you can keep track of your bookings and transactions. Collect points by reserving and paying through Qube. The more you book through the app, the more you pack up points that you can redeem as rewards offered exclusively to the Qube community. Plug in your credit card information to be able to book cinema seats and purchase tickets to upcoming events. Discover nearby venues, events and the screening schedule of the latest film releases. Select and tap the reserve button. Make sure your notifications for Qube are turned on so that you can follow up on your reservations. © Applab 2019. All Rights Reserved.